Quit Teaching…Become a Learning Facilitator. Learn strategies, tools, and techniques to make the shift from Teaching to Learning Facilitation. This 55-page ebook is packed with useful models, strategies, and approaches to re-energizing your approach to teaching and training. It specifically explores how to make the leap from conventional teaching to the skills, attitudes, and practices necessary to create and facilitate a learning environment. 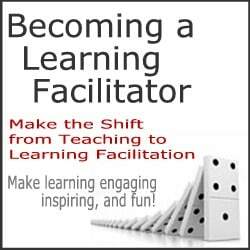 I downloaded the learning facilitator guide. I am a fan of Merriam, Caferrella and Malcolm Knowles, and you seem to have put it all in a wonderfully succinct form. It’s really great stuff. Thanks! FacilitatorU.com Membership Option. Become a FacilitatorU Member and receive this guide and a host of other items and benefits at an incredibly discounted price. An exceptional value. Click here for details.